Ever get those pesky old ice cream cravings? If you’re anything like us… it’s pretty much all the time. Well, now we’ve got something that’s even better! It’s just as delicious, easy to make and excludes the guilt. 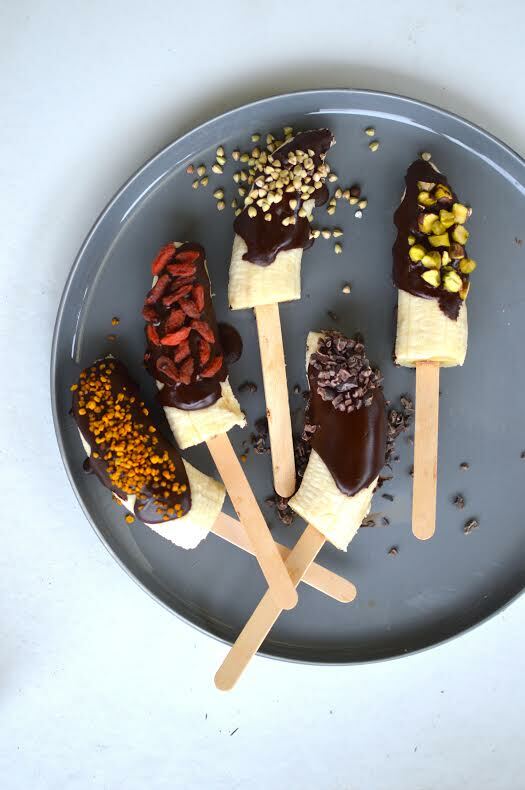 Introducing Chocolate Coated Banana Pops, the ultimate snack you can totally help yourself to! 2 tbsp coconut nectar or pure maple syrup. Peel bananas, cut in half and insert a paddle pop stick into the centre. Place on a tray and freeze for about half an hour. For the chocolate, mix all remaining ingredients (except the toppings) in a small bowl until smooth. Remove the bananas from the freezer and dip them into the chocolate, placing on a sheet of baking paper. Sprinkle with toppings if desired, and freeze for another 5 minutes.